Globalplacement.com is looking for enthusiastic students in the Sales Fields Of Expertise. 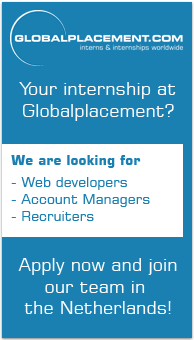 Globalplacement.com (GP) is an online internship mediator/service provider with an international focus. The Globalplacement idea came from the success of Stageplaza.nl (SP), which is a sister company of GP and the market leader for online mediation for students in the Netherlands. We are located in Culemborg (near Utrecht) The Netherlands with our Dutch sister organization Stageplaza.nl. We are working in a young team of about 20 people and are always looking for interns to strengthen our team in Sales, Communication, Recruitment, IT, Graphic Design to start before, during and after the summer. Please take a look at the vacancies below. If you are interested or would like to have more information, please apply as soon as possible!